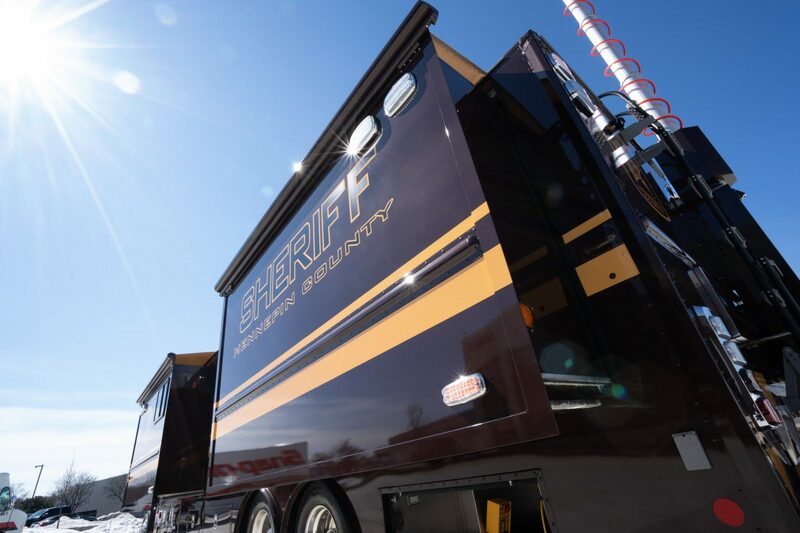 Your mobile command center is more than just a vehicle; it’s an extension of your department. 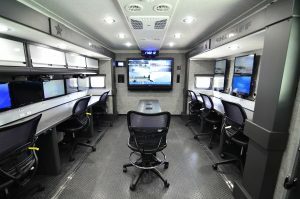 LDV’s innovative flat-floor slide-out rooms provide a functional work area for your mobile command center that can fit your needs with the touch of a button. What makes our slide-out rooms unique is their smooth, flat-floor finish when deployed. All components are housed within the slide-out, meaning no exposed wire chases or tracks. When the slide-out is engaged, an awning automatically extends and retracts to protect the top of the slide-out from accumulating debris. The flat-floor finish also allows for the use of standard ergonomic office chairs as opposed to pedestal mounted seating, allowing for better mobility and ergonomic comfort. Flat-floor slide-out rooms allow you to add extra width to the inside of your vehicle as well. 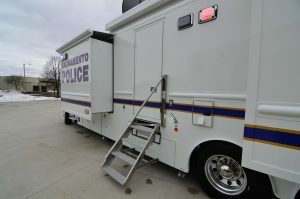 Say you’ve decided to incorporate a conference room and two slide-out rooms in the same area of your mobile command center. When the two slide-outs are deployed, your conference room’s dimensions can expand from 8×10 feet to 10×12 feet, giving you added functional work space. The extra space can be used for other applications such as additional work stations for staff. This creates a larger working environment that can accommodate more of your staff. 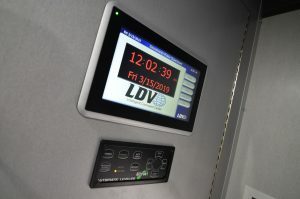 LDV’s exclusive Intel-I-Touch™ vehicle automation system controls the deployment of the slide-out rooms with the push of a button. Each slide-out room has its own icon on the Intel-I-Touch screen, merging independent deployment with one-touch system use. Everything is automatic so components do not have to be moved manually inside or outside of the vehicle in order to deploy. Our vehicle automation system also employs a safety interlock, preventing the vehicle from moving while the slide-out rooms are in use. LDV’s Intel-I-Touch is the simplest and safest method to control your flat-floor slide-out rooms and other vehicle systems. At LDV, we understand that your vehicle needs to provide both ingenuity and comfort when out in the field. For your mobile command center, consider flat-floor slide-out rooms to increase functional work space and comfort for your staff.